In Dynasty 17 a new type of coffin appeared in Thebes: anthropoid, but no longer conceived solely as an inner coffin, and resting on its back because of a change in funerary customs whereby the deceased was no longer laid on one side. The anthropoid coffin was to become the burial container of choice among royals and commoners alike. The earliest examples are decorated in paint with a feather pattern, and so they are known by the Arabic word for “feathered,” rishi. Carved from local sycamore because the Thebans no longer had access to imported cedar, all rishi coffins, royal or private, show the deceased wearing the royal nemes headdress. This example was clearly a stock item made for a commoner, for a blank space was left for the owner’s name to be inserted at the end of the vertical inscription on the lid (a conventional offering formula for the dead). Great vulture’s wings envelop the legs and lower abdomen. Even the top of the headdress is decorated with a feather pattern so that the deceased appears as a human-headed bird according to the concept of the ba, or mobile spirit. The ba could travel to any place and transform itself into anything it desired. 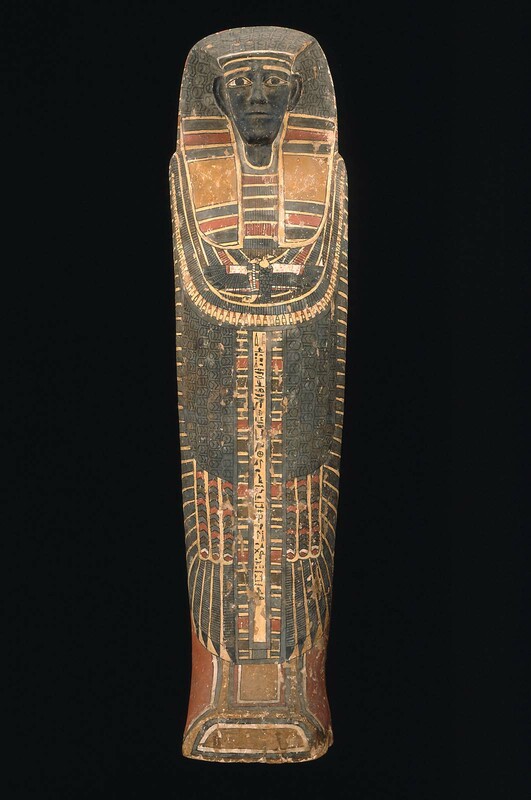 The face on the coffin is painted black, not to represent the unknown owner’s race but to reinforce his identification with Osiris. The flesh of the god of death and resurrection was often shown as black or green to signify the black silt that fertilized the land with each year’s Nile flood, and the new life in the form of green vegetation that it brought forth. Painted on the chest is a pectoral, or chest ornament, in the form of a vulture and cobra, symbols of Nekhbet and Wadjyt, the tutelary goddesses of Upper and Lower Egypt. By 1987: with L'Ibis Gallery, New York (said to have been in a European private collection); 1987: purchased by the MFA from L'Ibis Gallery.